Where is the office of World Championship Ski School Top Alpin Walchhofer? The ski school office is located at Hotel Zauchenseehof. When are participants assigned to groups? Participants meet at the assembly point next to the Zauchensee/Rosskopf lifts at 9:40 a.m. After that, groups will be assigned based on ability level. Is the ski pass included in the price of the course? The ski pass is not included in the price of the course. You will need to rent out your own equipment at a shop of your choosing in town. (Intersport Schneider or Sport 2000 Klieber). Do you have ski instructors who teach in foreign languages? Most of our ski instructors speak German and English. We also have instructors who speak Dutch, Czech, Russian, Spanish and French. When booking group instruction, we are unable to guarantee ski instructors with specific linguistic skills. However, it is possible when booking private lessons. Should I book my ski course in advance? We recommend booking courses in advance using our website. You will then receive your course ticket from our ski school office after you arrive. Do I have to attend my course on consecutive days? Yes, otherwise you will forfeit the days you have missed. Are course times for parents and children coordinated? Yes, meeting points and course times are the same for adults and children. Are course fees ever reimbursed? Course fees are only reimbursed in the event of illness or injury. A physician’s attestation is required. It is possible for experienced skiers to join ongoing courses. Is it possible to book just a single day in a group? Yes, it is possible to book one day in a group, though we always recommend three days. What is the correct length of ski? We recommend consulting our local partners. Intersport Schneider or Sport 2000 Klieber. Our practice area, Bobo Kinderland, is located close to the valley station of the Zauchensee/Rosskopf lifts. Can I book a sampler day? All child beginners and those attending the Bambini Club always book a sampler day to start out. If they choose to keep going, they can pay the difference and attend a multi-day course. By arrangement, children with skiing experience can also book a sampler day. Can lunch be booked on a day-to-day basis? Lunch can be booked on a day-to-day basis once you are here. All children’s groups enjoy their lunches at Hotel Zauchenseehof. What is the minimum age for children to attend a ski course? 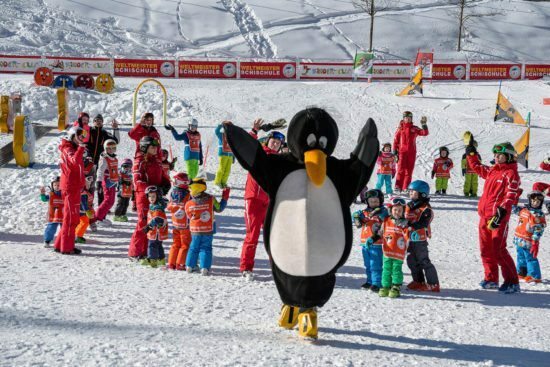 Children ages 3 and up are welcome to attend the Bobo Bambini Club, which includes playful ski instruction. All-day beginners’ courses are possible for youngsters ages 4 and up. Children are primarily assigned to groups at our ski school based on their abilities. If your children or their pals have roughly the same skiing ability, please let us know and we’ll do our best to keep them together. If it turns out that the children aren’t equally as skilled, then the child who is the better skier would have to switch to the group which the weaker skier is attending. Am I a beginner or "experienced"? Everyone who has never stood on skis before, or who hasn’t yet mastered the art of turning, is classified as a beginner. From what age are you required to buy a ski pass? This information can be found on the webpage of the Zauchensee Lift Company. When do the ski races and awards ceremonies take place? The ski races take place Thursday morning, while the awards ceremony is held on the same afternoon as the course is completed. (The awards ceremony may be delayed during the Christmas holidays). Are there also half-day courses? Experienced children do have the option of taking part in half-day courses. If there is a clear difference in ability compared to the rest of the group, the child may be asked to join a lower group more appropriate to their skills. Should a private instructor be booked in advance? We recommend booking private lessons online in advance, so that we can guarantee you get exactly what you are looking for. When do adult courses begin? The courses for adult beginners (never been on skis before) begin on Sunday. Courses for experienced adults begin on Monday.